Brussels: Hotel de Ville in Beautiful Buildings in France and Belgium by C. Harrison Townsend, pre-WWI picture by Benoist after N. Chapuy. From, Beautiful Buildings in France & Belgium, Including many which have been destroyed during the war. Reproductions in Colour and Monochrome from rare old Prints and Drawings, by and after Prout, Boys, Coney, W. Callow, David Roberts, C. Wild and others, with descriptive notes, by C. Harrison Townsend, F.R.I.B.A. ; New York: The Hubbell Publishing Co., 1916; pp. 70-73. GAIN, in this Plate, is impressed upon us the fact that the Town Halls and the Trade Halls of Belgium were the characters in which she wrote or graved the record of that civic and commercial enterprise that gave her distinction amongst neighboring nations. And grandest of them all, and placed in the favorable setting of one of the finest mediæval squares in existence, is that of Brussels. 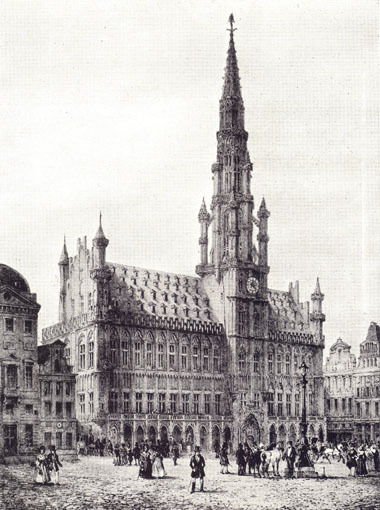 Its size is inferior to the now unhappily ruined Cloth-hall at Ypres, but the spire that rises from its highly ornate yet dignified façade is unrivalled for beauty of 72 outline by any spire in Belgium. This slender and graceful feature — which for some reason was not constructed in the centre of the front of which it forms part — rises to a height of 370 feet, and is surmounted by a gilded metal figure of the Archangel Michael, over 16 feet in height, and put in position as early as 1454.